Oh, thank goodness the federal government finally decided that we can continue to collect antique items made at least partially of ivory such as this fabulous folk art portrait miniature! So many antique dealers and museums labored long and hard to make the government understand that these true antique pieces do not pose a threat to living elephants. I am really thrilled to be offering this portrait miniature attributed to Charles Willson Peale. Peale is one of the founding fathers of American portraits. He a saddler, harness-maker, clock and watch-maker, silversmith, artist in oils, crayons, wax, and miniature. He was a soldier, legislator, lecturer, taxidermist, and dentist. He married a succession of wives and had children with all of them. He fathered 17 children, 11 who lived to adulthood. A true artist, Peale named his children after artists who had blazed the way before him: Raphael, Rembrandt, Rubens, Titan, and Van Dyke were the names of some of his sons. However, starting in 1794, Peale showed his burgeoning fascination with science by naming the rest of his children after famous scientists. He developed a method of taxidermy and, in 1786, opened one of the first museums in the nation in Philadelphia. The museum did not make enough money to support his large family, so Peale went back to painting portraits while he and his sons managed the museums (of which there were eventually 3). America’s founding parents are now largely known through Peale’s paintings of them. 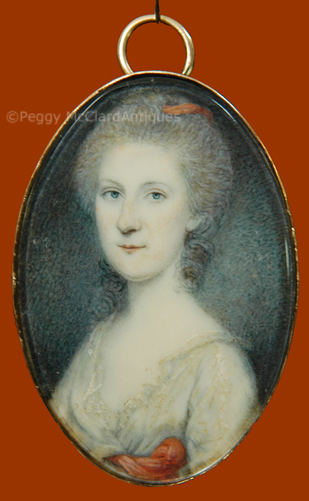 This circa 1778 portrait miniature is one of at least likenesses Peale painted of Mrs. Mary McIlvaine Bloomfield (1752–1818). Mary was First Lady of New Jersey from 1801–1802 and from 1803–1812 while her husband, General Joseph Bloomfield (1753-1823) was in office as governor. Mary was the child of Dr. William McIlvaine (1722–1770). Dr. McIlvaine was born in Ayr, Ayrshire, Scotland, and practiced as a physician in Burlington, New Jersey. He died in Bucks County, Pa. Mary’s mother was Mrs. Anne Emerson McIlvaine born about 1725 Philadelphia and died about 1758. Mary had two brothers, Joseph & William. Mary’s brother Joseph died in 1787. Mary and Gen. Joseph Bloomfield raised her brother Joseph’s son, Joseph Bloomfield McIlvaine as their own. Other than their adopted son, Mary and Gen. Joseph had no children. 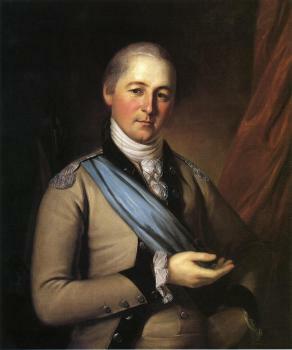 The man the Bloomfields raised as their own became a clerk of the county of Burlington, New Jersey; United States Attorney of the District of New Jersey; captain in McPherson's Regiment of Blues as early as 1798; was appointed aide on the staff of the Governor of New Jersey with the rank of colonel in 1804; and elected Democrat to the United States Senate in 1823. Mary died at the age of 66 in 1818. Her husband remarried and then died 5 years later at the age of 70. Mary and Joseph Bloomfield (and his second wife, Isabella Ramsey) are buried in St. Mary’s Churchyard in Burlington, New Jersey. Mary’s husband General Joseph Bloomfield (1753-1823) practiced law in Burlington, New Jersey and was the registrar of the admiralty court from 1779 to 1783. He served as the New Jersey Attorney General from 1783 to 1792 and as a trustee of Princeton College from 1793 until his death. He was elected the fourth Governor of New Jersey as the first Jeffersonian-Republican to hold that office. He served as governor from 1801–1802 and, then again, from 1803–1812. Bloomfield was elected as a Republican to the Fifteenth United States Congress and reelected to the Sixteenth Congress from March 4, 1817 through March 3, 1821. Bloomfield ran for, but was not elected to, the Seventeenth Congress. In 1796, what had been known as the Old First Church was formed and was named the Presbyterian Society of Bloomfield in honor of Joseph Bloomfield. When the Township of Bloomfield was formed, the name was taken from the name of the Presbyterian church. Joseph Bloomfield was quite proud of his military service, which he began when he dropped his study of law (almost completed) to join in the Revolution as a captain in the new Continental army. He resigned in 1778 with the rank of major. He also served as a general commanding the New Jersey militia. Bloomfield was a key player in cementing the Jeffersonian party in New Jersey from 1796-1800. The Jeffersonian-Republicans captured control of New Jersey in 1801.
p>Peale painted at least two portraits of Mary, one oil on canvas and this miniature. He painted at least one of her husband (oil on canvas). Peale’s portrait of General Bloomfield was painted in 1777, one year before his marriage to Mary. Peale dated Mary’s oil on canvas portrait 1783. To my eyes, this miniature shows us a younger Mary than the large portrait. I suspect that Peale was commissioned to paint this miniature during Mary and Joseph’s engagement or as a marriage gift, either 1777 or 1778. Mary probably wears a wig. The hairstyle is frizzed, stuffed to make it stand out farther from the head (often horsehair stuffed into cushions), stiff shoulder length curls on each side of her neck. The back of her hairstyle likely includes a “banging chignon” although we cannot see it from our view. It appears that her hair is powdered. Her white dress has a low cut décolletage which crosses at her bust and tucks into the bodice of the dress. The neckline is edged with stiff white lace. 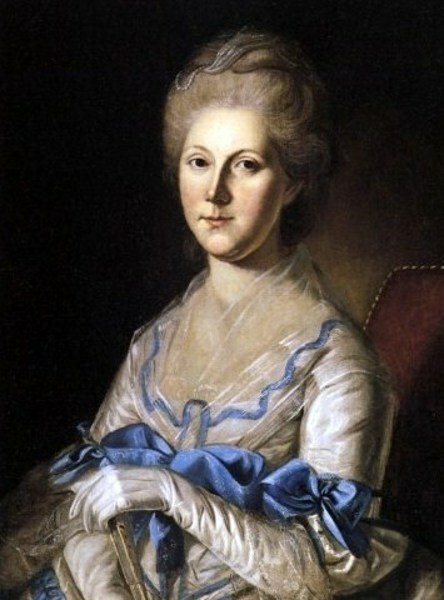 The white color of the dress and the pale color of her skin is punctuated with the dark background and the touch of red that Peale included in Mary’s sash and hair bows. The portrait resides in what appears to be the original pendant case which has a very thin plain front edge but decoration along the outside edge that is lovely gold-work. Please note that I do not test metal and cannot say whether the pendant is gold, some other metal or a combination of both. From the looks of it, I would guess that the edging of the pendant is gold and the back is some lesser metal. The condition is lovely with no cracks, warping or restoration that I can see. The pendant case does, however, look as if it has been opened at one time. It is likely that the case was opened for cleaning. 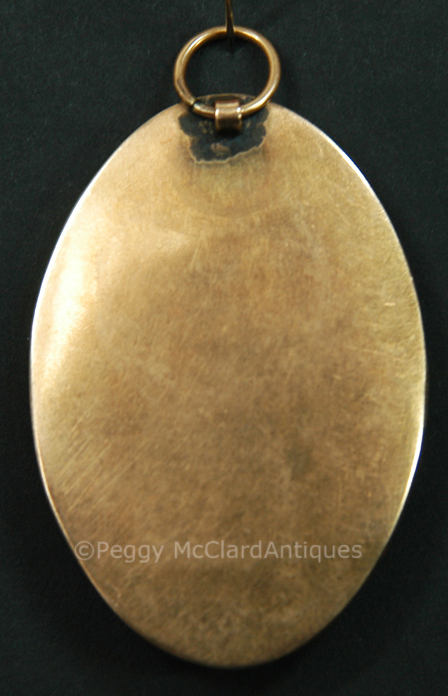 The pendant is 1 7/8” x 1 ½”….a small size appropriate and expected for the period. This is a wonderful opportunity to own an original portrait by one of the most important Revolutionary period artists. It is a stunning portrait miniature.